StorageCraft, a data backup and disaster recovery provider, has recently introduced OneXafe, a converged scale-out storage and data protection platform. 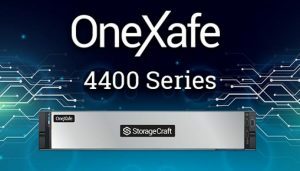 The new offering has been in development for about a year and is designed to address both converged primary and secondary storage.StorageCraft’s OneXafe Converged appliances are priced as follows: OneXafe 4400 pricing starts at less than $14,000 USD for 144TB. Pricing for the OneXafe 5400 starts at just under $30,000 USD for 38TB, according to StorageCraft. More specifically, the new offer targets mid-size businesses who have a lot of the same data protection challenges as enterprise companies but may not have enterprise sized budgets. StorageCraft’s budgetary pricing includes multiple appliance like the 4417 and 4412, converged data protection and primary storage for unstructured data, archiving and video repositories; and all flash OneXafe 5412, converged data protection for instant application recovery requirements and high-performance unstructured data to serve primary virtual server production application needs. Regarding cost, StorageCraft contends that its expertise is in the midmarket and that it can deliver a cost-effective solution, one that’s even less expensive than Amazon S3 storage.